Abstract Shank proteins are multidomain scaffold proteins of the postsynaptic density, connecting neurotransmitter receptors and other membrane proteins with signaling proteins and the actin cytoskeleton. 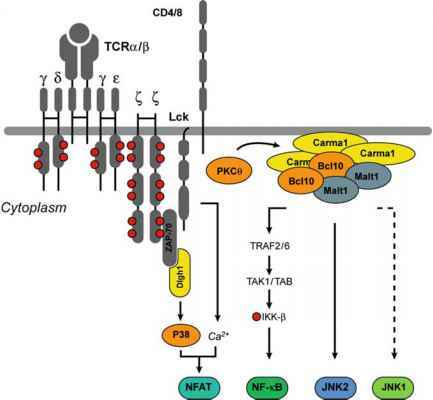 By virtue of their protein interactions, Shank proteins assemble signaling platforms for G-protein-mediated signaling and the control of calcium homeostasis in dendritic spines. In addition, they participate in morphological changes, leading to maturation of dendritic spines and synapse formation. The importance of the Shank scaffolding function is demonstrated by genetically determined forms of mental retardation, which may be caused by haploinsufficiency for the SHANK3 gene. Consistent with its central function within the postsynaptic density, the availability of Shank is tightly controlled by local synthesis and degradation, as well as actin-dependent dynamic rearrangements within the dendritic spine.